You just took a trip to the farmers' market and now have enough zucchini, cherry tomatoes and corn to feed you for a week. 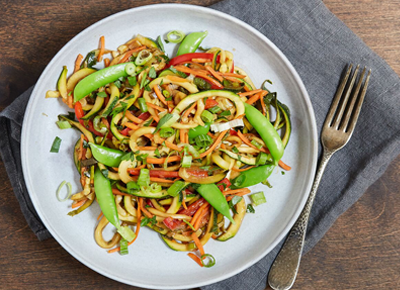 Well, we know just what to do with it all: Make our recipe for zoodles (aka zucchini noodles) with summer vegetables. Best of all, it's ready in just 25 minutes. 1. In a large sauté pan, heat the oil over medium heat. Add the onion and sauté until tender, 4 to 5 minutes. 2. Add the peppers, zucchini noodles and tomatoes, and sauté until tender, 4 to 5 minutes. 3. Stir in the corn and toss to combine. Season with salt and pepper. 4. Serve warm, garnished with mint.